TL;DR version – Better Transit YXE’s twitter handle, @BtrTransitYXE, will become the Twitter voice of Bus Riders of Saskatoon. A few guidelines and improvements that can be made to make taking the bus a safe, fun experience… no matter what time of day. 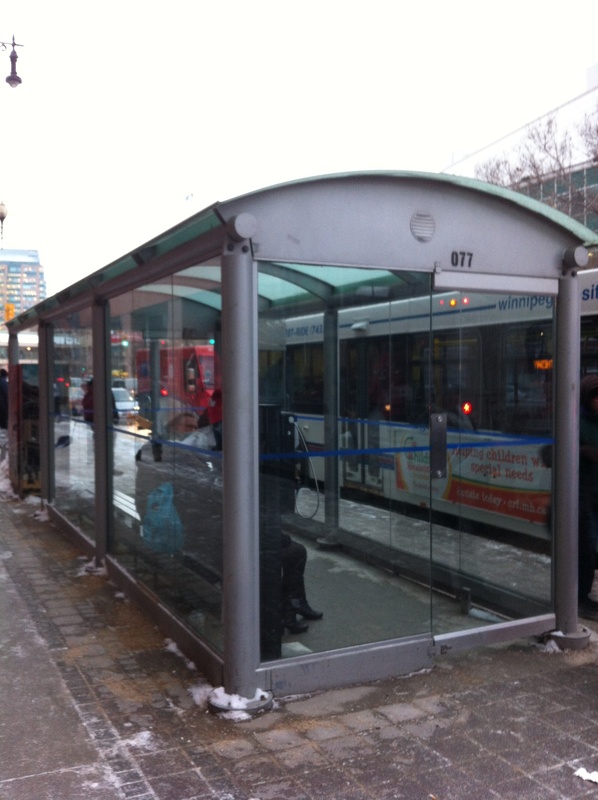 Relocate bus stops to areas that maximize visibility and social interaction. Ensure bus stops are well lit. Avoid too-bright security lighting that creates blinding glare. It is better to use a larger number of lower intensity lights instead. Having community members and organizations ‘adopt a bus stop’ will ensure that they are well This communicates an alert and active presence in the space. Place more trees at the bus mall. Outdoor spaces with more trees are seen as significantly more attractive, safer, and more likely to be used than similar spaces without trees. Display security system signage at bus mall and on buses. Placing amenities such as seating or refreshments at the bus mall helps to attract larger numbers of people. Scheduling activities at the bus mall increases proper use, attracts more people and increases the perception that this area is controlled. The Broken Windows Theory is a valuable tool in understanding the importance of maintenance in deterring crime at bus stops. Broken Windows theory states that the presence of broken glass will entice vandals to break more windows in the vicinity. The sooner broken glass is fixed, the less likely it is that such vandalism will occur in the future. In the same way, the faster graffiti is painted over, the less likely one is to repeat because no one saw what has been done. Having a positive image in the community shows a sense of pride and self-worth. Where Does Your Mind Wander When Your On Transit? For me there are times when I am on the bus when I am out of mind. Other times when my mind is alive. Times when I hallucinate on the real and see it in the context of its meaning. Because I do not have to focus on the rules of the road I let myself be taken up by distractions. These distractions, musings, reflection time is what I like to call ‘bus fiction.’ Travel is the special practice of recollection. Odd times in odd places carry greater weight of the emotions of real transition. How long can I remain in transit? When will I be home? 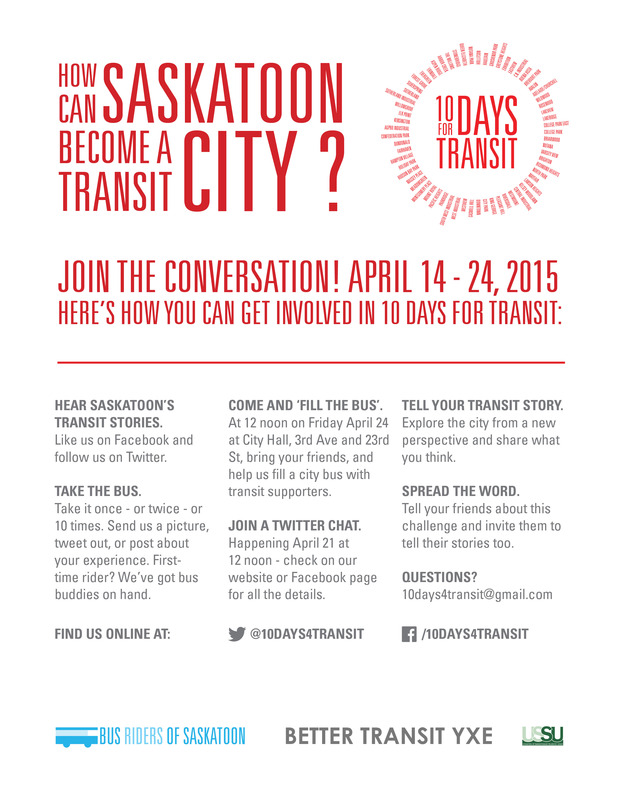 How can we re-think transportation in Saskatoon? Without of focusing on cars, parking, and the transporting of goods. Maybe if we focus instead on Public transportation. Saskatoon Transit has vast social and political significance as a powerful tool for accessibility in our city. We need transit to function well on the level of everyday experience but it also needs to provide opportunities for people to connect in a way that no other mode of transportation can. But first we must acknowledge that the current transit system is failing us on multiple scales. That is because buses and bus stops are not thought of as important multiple-use community centres, as places for children or where neighbors and strangers can have conversations. It is a given that traffic and road capacity improvements come along with population growth. But they are also the result of designing and organizing communities around the private automobile. It is a proven fact that road construction (and likely automobile bridge construction) actually increases traffic. It also causes a de-concentration of economic activity when it is moved to suburbs that are only accessible by car. Because of the assumption that the car was and always would be the first choice in Saskatoon, it has been designed to meet mobility needs rather than human needs like social interaction, physical activity, or a connection to place. Unless this changes, Saskatoon will continue to have a few isolated great places linked with car-dominated connections, sprawl, poor physical health, social isolation, and low-income communities. Many of our generation’s most pressing challenges are bound in some way to our relationship with our modes of transportation. Reduced physical activity is a leading cause of obesity and chronic disease. There is widespread social isolation and depression. Increased vehicle emissions have degraded air quality and contributed to the greenhouse gases causing climate change. We can conclude that a lack of transportation options for many communities has caused uneven access to jobs, social services, healthy food options, and community interaction. Clearly, we need to start thinking seriously about how we can reverse these trends and think of public transportation as a place for culture, creativity, and community. 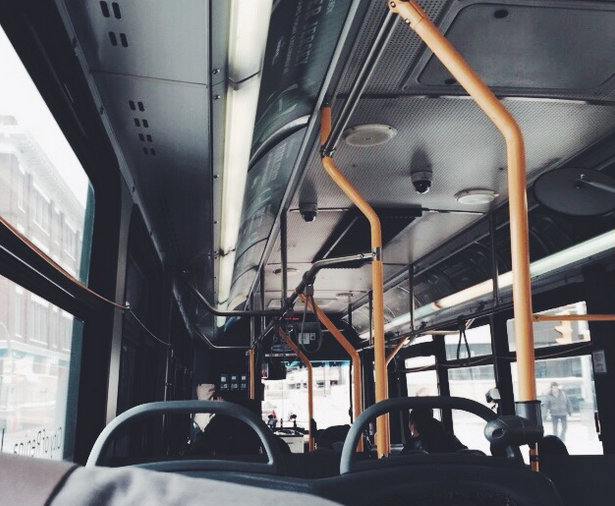 How can public transportation not just be about places to go but also be about places to be? How can we enhance the bus stops and on bus experience? 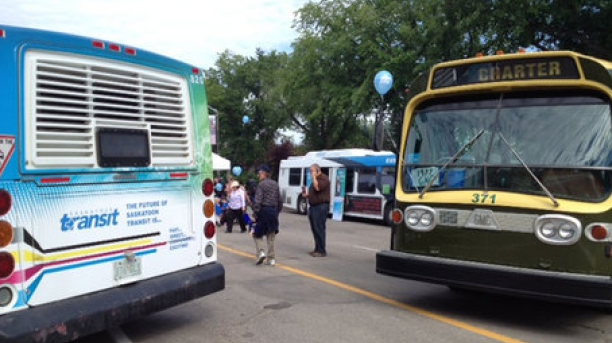 The Better Transit YXE movement wants to help people begin to see public transportation in its entirety: not just its function in transporting people and goods. Because buses play a vital role in animating the social and economic life of communities. This will be a process… citizens reclaiming public transportation, participating in civic life, and having a direct impact on how their transit spaces look, function, and feel. Maybe one day Saskatoon City Council will realize that public transportation is a right, not an option or privilege that only a fortunate few can enjoy. Together, we can turn our transit system into an interactive, functional, and fulfilling experience for everyone. What Will It Take For People to Stop Driving Cars? Traffic- Even though car commercials portray shiny SUV’s cruising along the country side… a more realistic portrayal would be in the middle of city congestion. Cars kill people- Pedestrians, cyclists, bus riders and cars all share the same space. It’s no secret that cars kill the more people than any other mode of transportation. Sprawl- If people had to rely on public transportation, walking and cycling… they would choose a place to live that best facilitates that. Horns and car alarms are annoying. They take up a lot of space- A car needs 300 square feet when parked or standing still and 3000 square feet when moving at 30 miles per hour. Sometimes there is only one person in this vehicle. Parking lots- These spaces would win space-wasting competitions. Parking- Count how long it takes you to find a sport, fit into it and then re-locate it later. Road rage- take our word for it, riding the bus, walking and biking are much more relaxing. Mechanics- you never know when something is going to break down. I believe that the above reasons should motivate us to use other forms of transportation! Maybe it isn’t possible to completely cut out cars from our lifestyles. But if we are more aware of all the reasons that cars are negatively affecting people’s quality of life… then it can motivate us to change their transportation behavior at least some of the time! Now we get to the hard part. How exactly can we change people’s behavior and attitudes towards public transportation? Inform people. Are people aware that Saskatoon even has public transportation? Make taking the bus easy. Helping people to know where to buy transit passes, how to look up their bus schedule and how to ride to bus so that they can feel confident doing it. Lets help people to see how taking the bus can fit into their life. Make taking the bus desirable. How will taking the bus fit into a positive self-image? How can we make people realize that taking the bus makes them more environmentally conscious, more social and more community minded? Make taking the bus rewarding. There is proof that taking the bus helps people save money, have more time for multitasking on the bus. How can we help people make taking the bus a habit? Once people have tried taking the bus, what can we do to help them keep doing riding it? Now its your turn for reflection, what do you think are barriers, triggers and motivators for taking public transportation in Saskatoon? Barriers – what are the things that stop people from taking the bus? Triggers – how could we get people to try out taking the bus? Motivators – what are the ways to help them stick with taking public transit? Sometime when you are travelling, it is nice to have something that makes you feel at home. For me, that was taking transit during my stay in Winnipeg last weekend. I was attending a conference downtown while staying with a relative in one Winnipeg’s many suburbs. My forty minute commute during my four day stay gave me much needed alone time to think and read between conference overload and visiting with family. But my first challenge was finding passes. I had originally planned to take transit from the airport to downtown but a transit stop at the airport was no where to be found. Instead, I shared a cab with some of my fellow conference go-ers. (Interestingly enough, the one way cab fare from the airport to downtown cost the same as 10 transit fares). From downtown I asked a friendly stranger where I could buy a booklet of transit passes and she informed me that although it used to be possible to be able to buy them at many different stores, Winnipeg Transit had recently limited sales to a few select stores including Shoppers Drug Mart. So on I went to locate a Shoppers Drug Mart. After asking three different people and walking for forty five min I eventually found one in a nearby mall. A package of 10 transit tickets came to about $2.10 each. (Saskatoon’s passes are closer to the $3 price point).Thankfully locating these transit passes was the most difficult part of my Winnipeg Transit experience. The rest of my rides were on time and very comfortable. After a few days, I got used to taking my number 14 bus. However, on my third day I was taking the bus very late at night when the weather was -25 Celsius. I was able to track down the number 14 but after boarding the bus I realized that this time the route was different and I was completely lost! I thought I had it all figured out. Thank goodness for the helpful bus driver who was able to understand my paniced explanations of where I was going and she informed me that there was two number 14’s that travel the same route but in opposite directions. Thanks to this helpful bus drivers, I was able to arrive home safe and sound. 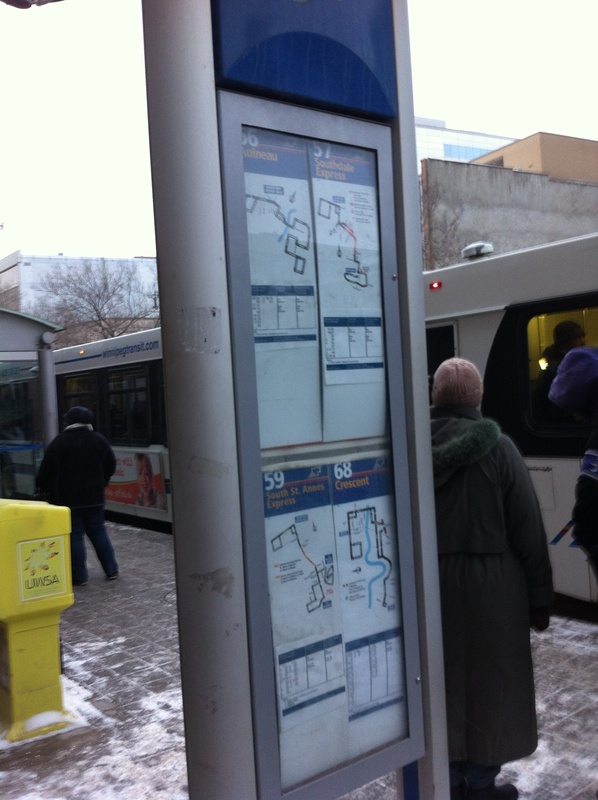 Below is a photo of a map indicating where the bus stops were located in the downtown area. A large scale map like this would be very helpful in the Saskatoon Transit bus mall. 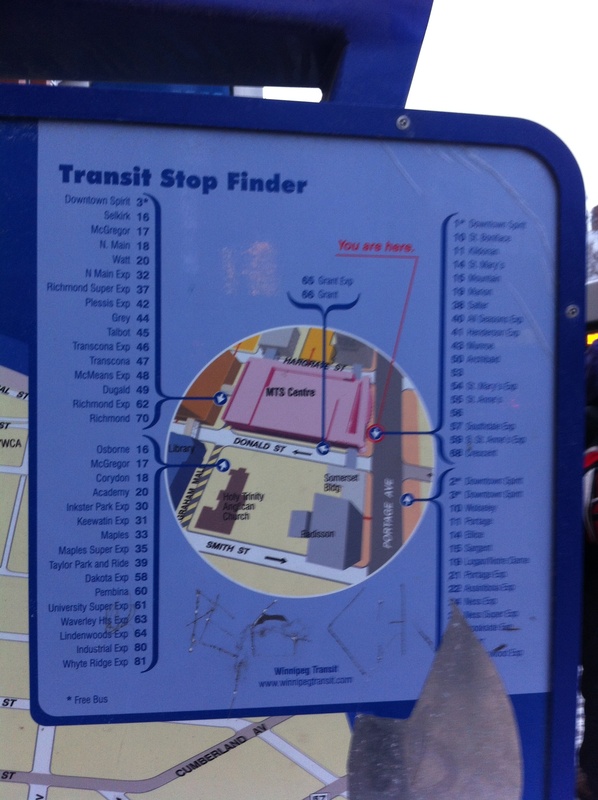 At each of the stops downtown there was a map of the bus route. However, these route maps where hard for me to contextualize without surrounding streets because only the roads that the bus travelled on were drawn. Below is a heavenly heated bus shelter that made my wait go by very quickly. 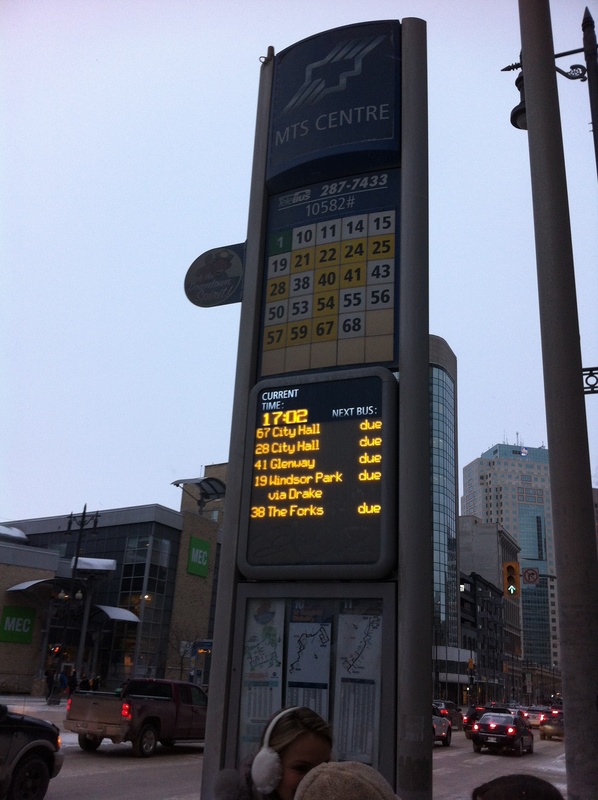 This last photo is of one the real time bus information signs at the bus stops. I saw dozens of signs like this one downtown along the major transit corridor. Maybe one day we will have signs like this in Saskatoon? A girl can dream.